We explored what is meant by embodiment (embodied cognition), drawing on some theoretical ideas around the body being the ‘hub of all meaning making’ (Merleau Ponty, 1945), highlighting cognition as enacted (through sensori-motor/ action); embedded (through beingness in the environment and social and cultural contexts); and extended (through notions of offloading cognition/ manipulation/ transformation; and finally the idea of an ‘amalgamated mind’ (Rowland, 2010), where the mind is seen as a set of (mental) processes (rather than cognition per se) and where ‘some’ processes are inextricably amalgamated through brain, body and environment. We explored ways of refocusing this debated term to ask ‘what is the body’. 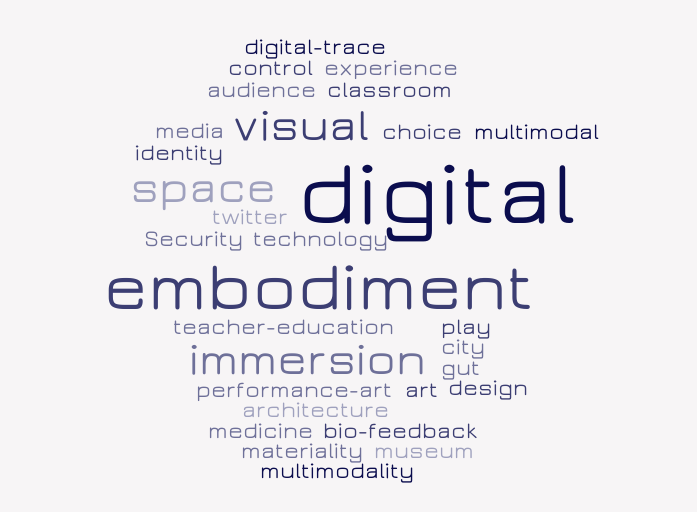 Why the body matters for digital technologies, was explored throughout the day, with a focus on the potentials of technologies reshape physical interaction, being in the environment, and bodily identities. We explored how each of us thinks about the body in our research, as well as the methods we use, and the challenges we face. We wrote these onto post-it notes and then worked with these to pull out themes across our different perspectives. We sketched this and used this sketch to explore how we each imagine the connections between body, environment and technologies in different ways, as well as our different starting points and emphases (like affect, or mode) as well as disciplines. Drawing on examples from MODE research we examined how different digital environments – mobile, tangible, whole body interaction, and simulation environments – conceptualise and draw the body into interaction in specific ways. The afternoon was spent exploring the theoretical, methodological, and analytical challenges of researching the body from a multimodal approach.